Andrea and myself Andrew, work together casting black magic spells for transformation. Andrea is a gifted psychic who uses her powers to look at a client's life and situation, then together we write up a customised black magic spell that will reshape your reality, and prove to you dreams can come true. Black magic penetrates all blockages, barriers and restrictions, it quite literally works ‘like magic.’ Unfortunately many people fear ‘black magic’ and a lot of our clients have used several ‘white’ witches without success before they start thinking about ' black magic?' After reading through this website they realise black magic holds the answer to their troubles. As mentioned above, black magic penetrates all obstacles, it is not blocked by thoughts of failure, free will, or any form of negativity - black magic gets what it wants, it doesn't find excuses. Either you want spell results or you don’t? If the answer is "yes", then you need uninhabited, potent black magic. Andrea and myself (A & A) always use full OCCULT PROTECTION and ensure nothing backfires, we have full control at all times. You can read more about black magic at BLACK MAGIC. If you are in agony, with an heart full of hurt and pain you will find a solution at BLACK MAGIC LOVE SPELLS. Or perhaps you are being bullied, and need to turn a situation around and ensure you are in control? 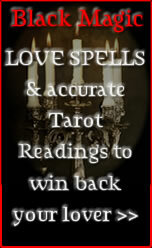 If so, our BLACK MAGIC REVENGE SPELLS will work very well for you. Andrea and I, welcome clients who know what they want, there is no need for a consultation BECAUSE Black Magic Spells works no matter what. However, if you prefer to contact us first for advice please do. YOU MUST BE 21 OR OVER TO USE OUR SERVICES. Upon receipt of your order, we will begin working on your case straightaway, we know anyone who has reached the stage where they have decided only black magic can help them is keen to get things moving, anyone seeking black magic has already decided their requirements are of paramount importance, and they have only one question "will a black magic spell work for them?" Yes, black magic works for everyone, no matter what the situation might be. Once you order a black magic spell your results are DESTINED, but since you are only human and may need extra support, we therefore supply a psychic reading with your order. Up to 10 questions will be answered; Andrea will do a reading especially for you - sometimes the answer to a question is a straight 'yes' or 'no', at other times Andrea’s findings will be advice, but at no time will you be asked to do anything you feel uncomfortable with. Andrea reads photos too (pychometry), photos capture energy the human eye cannot see, such as orbs, and human energy. We can manage without photos if you don't have access to them, if you do they will help and can be emailed to us or posted. Our spells work A.S.A.P, unlike white magic they bash all obstacles out of the way to get what they want i.e. YOUR RESULTS. We have many years experience, and know how to ensure a client feels valued and important, and most importantly, that they get the results they have paid for. We do not give up until you have results! You must be over 21 to use this website.